Ten Little Caterpillars - Bill Martin, Jr.
After reading The Very Hungry Caterpillar, print this sheet of sequencing pictures out. Have your child cut them apart, color the pictures, glue them to either index cards or slips of paper about the same size. Let the child put the cards in order a few times. Then, if your child wishes, you could easily staple the pictures together (after letting the child put them in order for you), put a cover sheet on it, & give your child their own little "book" to retell the story. Go over the days of the week to make sure your child knows them. Use The Very Hungry Caterpillar this week to review as needed. Use this site to study the differences between a butterfly and a moth. Let your child act out the process of changing from caterpillar to butterfly by making each as well as a chrysalis to keep them. 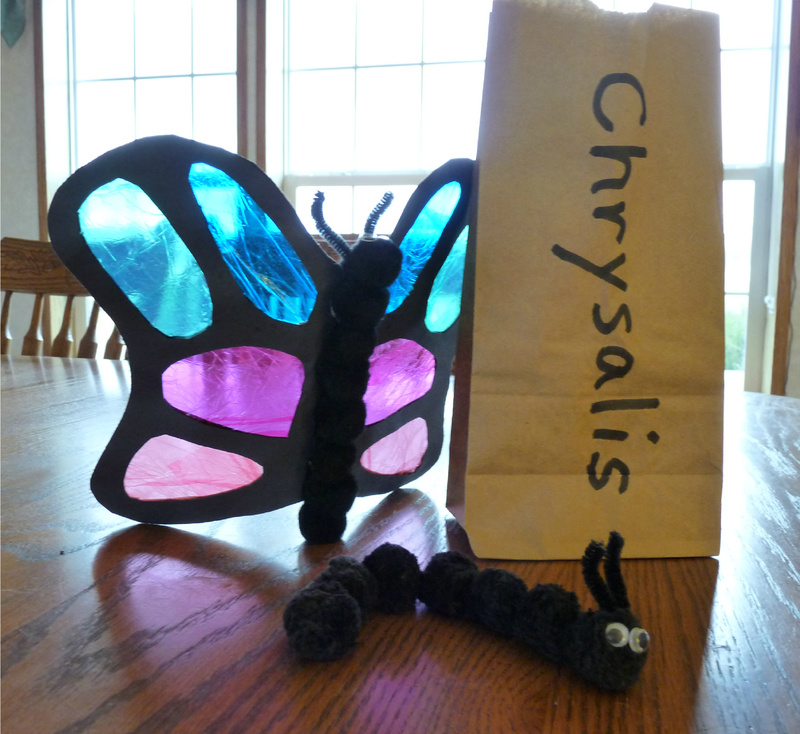 I use a paper lunch sack & label it "chysalis". For the caterpillar, you can sew 7 black pom-poms into a string, use a black pipe cleaner bent in half & sewn on the head to make the antennae. Have your child glue wiggly eyes on the head. Make two caterpillars exactly alike. Then take one & glue it to the center of paper wings for the butterfly. For the wings, I make cutout windows in the wings & put colored cellophane between the papers to make beautiful wings. You can make yours however you want, just make sure it can fit into the bag. After it dries, "hide" the butterfly in the chrysalis sack so your child can act out their caterpillar going in the sack & pulling the butterfly out. Here's a fancier version if you really want to get sophisticated. And here's a simplified version shown step-by-step. Just make sure however you make your butterfly, that the caterpillar is the same on both so your child sees the creature change and makes the connection. ALSO, please note that butterflies have two wings that are exactly the same - symmetry!! DO NOT make one wing different from the other. Use this week to teach what symmetry is & look for it around the house, on your body, etc. Talk about what symmetry is. You can either let your child make some symmetrical crafts like these painted butterflies, or do a few worksheets. This one lets your child draw lines down the middle of butterflies to find symmetry. This one has your child decide which butterflies show symmetry & which do not. And this one lets your child complete the other half of a butterfly to make it symmetrical. Print out two copies of these beautiful butterfly pictures on heavy weight paper & cut apart to make a butterfly concentration game. There are 24 different butterflies, some with tiny differences. This activity will build attentiveness to detail. Act out what happens in each stage of the butterfly's life cycle with blankets, paper leaves, and "wings". See how one family did it here. Cute! Maybe make your own family movie version. There are a few short but neat videos as well as a few coloring pages you might be interested in here. If you haven't lined up a musical field trip yet, or you can't find a live performance going on around you, ask a friend, neighbor, relative to put on a personal performance for you with an instrument. Look over the choices of instruments to make for next week & make sure you have the needed supplies for your instruments of choice. Get books for the music theme ordered & picked up for next week. There's still time to pick up an ant farm if you want to do that in a few weeks. Hobby Lobby usually has one, but sometimes it can be hard to find this time of year. You still have time to order one, too. If you're sure you have ant hills outside at your house, I wouldn't bother ordering a fake one to keep inside. Just my two cents! While you are at Hobby Lobby for the ant farm, you may want to buy some colored sand for sand crafting during the Ocean Theme in a few weeks. If you choose to do kits instead, this week would be a good week to order them. Here & here are a few choices.